Whew! You just researched and wrote an incredible blog post. You created the gorgeous graphics. You checked your links twice. You did all the things to make your blog post happen. It’s time to relax, put your feet up, and enjoy a piña colada. Right? Not so fast! 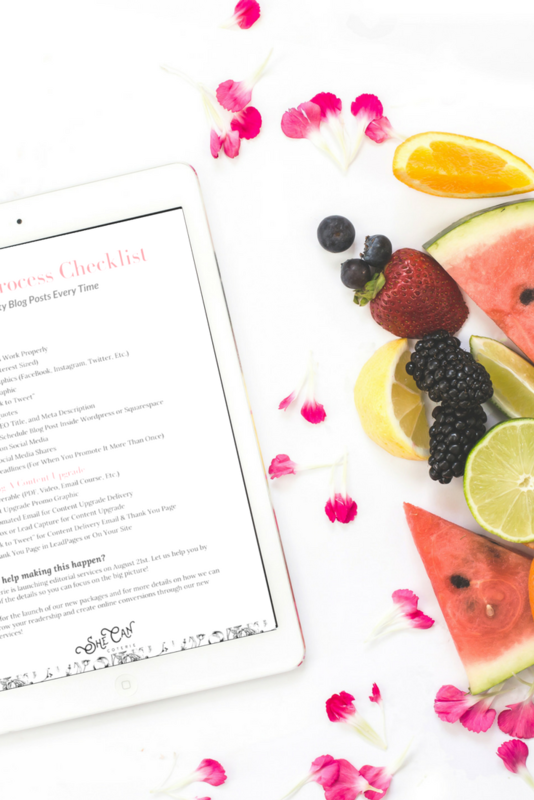 Checking off every box on our blog post process checklist is a great start, but there’s more you can (and should!) do after you hit publish that will help your post succeed and be seen by your people (and potential clients). We’re here to help. Let’s talk about everything you should do after you hit publish on your polished blog post. 1. Share your post immediately on social media. Remember those graphics you created before you hit publish on that post? Put them to good use! Write an Instagram post sharing a little peek of the content of your blog post and then direct your followers to your website to read more. Take to Twitter and use those 280 characters to their best ability. Share that Pinterest-optimized graphic. BONUS: Don’t say the exact same thing on each social media platform! Tailor the message of each post to fit the vibe of each platform. By sharing your posts immediately, you’re keeping your readers updated on what’s going on on your website. Don’t feel like you’re annoying them - that’s why they follow you! 2. Schedule your future social media shares. One reason why you should focus on creating evergreen content is so your posts can be shared anytime and they will still be relevant and useful to your readers. Share a link on Twitter later in the week and ask your followers if they’ve had a chance to check out your most recent post yet. Schedule another social media share a month from when the post went live to keep directing your followers back to your website. You can even schedule links that will go live a year from when your content is published! Keep driving that traffic back to your past content and make it work for you. BONUS: If you pull quotes from your blog post before you hit publish, it will make scheduling future social media shares easy peasy! 3. Add your post to your Pinterest board schedule. Pinterest is an epic visual search engine that can bring your content to the next level by connecting you with your dream audience and cultivating a new group of raving clients. Use it to your advantage and get a Pinterest board schedule in the works! There are over 150 million active users just waiting to see what you have to offer. If you aren’t looking to learn all the ins and outs of Pinterest or take your own time to create a schedule and strategy, let us help. We have a Pinterest manager just waiting to help you increase your page views. TWEET THIS: "Not sure what to do after you hit publish? Let She Can Coterie help!" 4. Do a Facebook or Instagram Live about your post. After you hit publish, hit “go live” on whichever social media platform you prefer and tell your followers about your most recent post! One reason why using this feature is so effective is because it gives a peek at the face behind the computer screen. People want to buy from people! Don’t be afraid to show your personality - get a little kooky and don’t worry about messing up. The more “real life” you share, the better! 5. Share your post with your email list. Chances are, people are signing up for your email list because they aren’t visiting your site on their own every day to see if you’ve posted something new. Give the people what they want and let them in on when you have something new to share with them! Nothing turns a reader off more than a blogger who doesn’t take the time to post even a short reply to their comment. Keep the conversation in the comments going and your readers will keep coming back again and again. Remember… people want to buy from people! If you have to, schedule time in your week set aside just for answering comments. It'll be worth it - we promise! There you have it! Six steps to do after you hit publish on your blog post that will take it to the next level. If you haven’t read it already, make sure to check out our list of everything that goes in a polished blog post so you know what to do before you hit publish too. We put that checklist into a fun freebie so you won’t forget any of the steps. Sign up below and we’ll send it to your inbox! Does reading posts about blogging make your head spin a little bit? Are you convinced that you still need a blog in 2017, but aren’t sure that you have the time to make it happen? She Can Coterie has just the thing for you… a Content Management package that will take your blog from mediocre to thriving! Schedule a call with our Content Manager today and get all the details. Now go enjoy that piña colada. You deserve it.